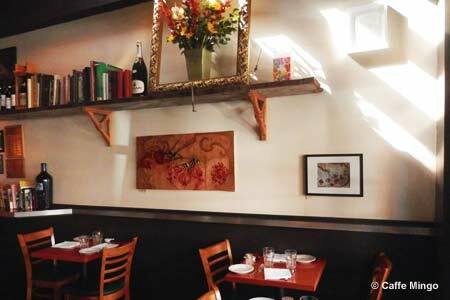 An intimate, romantic setting for consistent and authentic Italian cooking. : In an industry marked by constant change, Caffe Mingo's quality Italian cooking remains consistent. The menu changes weekly, but the staff has stayed the same for years. People wait up to two hours on the weekends to eat here, and for good reasons. The owners understand the key to Italian cooking is fresh ingredients, simply prepared. Happily, Bar Mingo absorbs the waiting crowd and it’s a fine place to sip a cocktail, or you may just enjoy the limited array of small plates. The setting is casual in the main restaurant with a scattering of tables and a counter overlooking a bustling open kitchen. Start with the bread served with rich, flavorful olive oil before choosing the beet salad with goat cheese or the understated Caesar. Penne al sugo de carne (fork-tender beef in an espresso tomato sauce) has been available forever, and deservedly so, as has the crab with lemon cream sauce. You can't miss with whatever house-made pasta is on the weekly lineup. Seasonally changing dishes can include a braised whole artichoke with roasted garlic aïoli; seared albacore tuna salad with kohlrabi, radish, cucumber slaw and tarragon oil; or a caprese salad with mozzarella. For dessert, classics such as tiramisu or panna cotta are good bets. The first-rate, mostly Italian wine list complements the cuisine.